Growing Leeks. How to Grow Leeks with Tips, Pest & Disease Control. Leeks have earned themselves a reputation as the "gourmet's onion." They are tasty additions to casseroles and stews and can also be enjoyed raw. The fact that they're rich in nutrients and expensive to purchase are additional reasons for growing leeks in your garden. 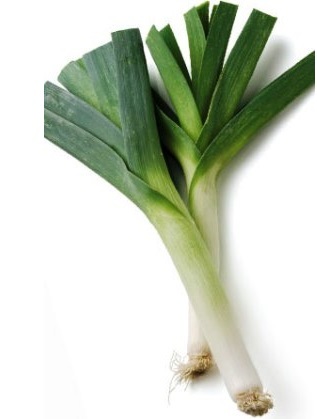 Leeks are hardier than onions as well and can survive cold winters without showing any adverse effects. Growing leeks in soil that's moist but well-drained is best. They also require as much sunshine as they can get so it's a good idea to allot the sunniest part of your vegetable garden to them. Take the time to prepare the soil prior to planting. Add large quantities of manure and organic compost to the soil to improve its ability to retain moisture. This is necessary to encourage the growth of the leeks during the early stages. Drier soil conditions have a better effect on their growth as they mature. Early spring (between March to April in northern hemisphere, and September to October in Southern hemisphere) are ideal for leek planting. To begin with dig shallow trenches. Sow seeds in these trenches about 2.5cm (1") apart by using the edge of your rake to make a 1cm groove in the soil. Place the seed there and then cover it with soil that has been finely sifted. Firmly tamp the soil down and water it if you feel it's dry. Plant rows that are not less than 30cms apart. In about 4-5 weeks' time you'll notice that each seedling has put out at least three leaves. This is a good time to thin the seedlings, making sure that there's a gap of about 15cms between each. You can make use of the seedlings you’ve uprooted to fill in the gaps where required. Make use of mulch to retain soil moisture which is essential at this stage. Mulching also prevents the growth of weeds which can easily compete with the seedlings for nutrients. Keep an eye on the soil to ensure it's moist. Water it when you find it's dry. Keep the surrounding area weedfree. Trim the leaves of the growing leeks that seem to be drooping onto the ground surface. Also keep adding soil to the trench around the stems. This helps to keep the area dark by keeping out the sunlight. This process is referred to as blanching. Though you can wait until stems grow to a considerable length, you can start harvesting once they reach the size of a pencil. Some people prefer to harvest when the leeks are still tender as they enjoy that flavor a lot more than that of mature leeks. Since leeks are best enjoyed fresh, it's smart to harvest them as and when you require them in the kitchen. However, the general rule to keep in mind is that they all need to be out of the ground before the frost sets in.